Thousands of students are fulfilling their academic dreams by studying online – and you can too with help from Online Business School. Looking for a good reason to study? To help inspire you, here are seven reasons you should start online learning right now. Expanding your knowledge can make you feel good about yourself. When you are confident about your knowledge of a subject, you feel a personal sense of satisfaction and pride. Higher education can provide a huge lift to a person’s self-esteem. Completing a degree is no small task, therefore it’s only natural that graduates should be extremely proud of their achievements. This boost in self-confidence can often propel graduates to apply for a new career and take on new challenges and opportunities. Online learning requires strong self-reliance, self-motivation, time-keeping and organisational skills. As a result, online learning graduates can benefit from enhanced confidence in these areas that set them apart from traditional graduates. Cost is often a barrier to education, but we offer competitive prices and flexible payment plans so you can invest in your future without breaking the bank. As you’re studying remotely, you won’t have to worry about additional accommodation or travel costs either. When you study online, learning fits around your life, not the other way around. You can commit to a few hours in the morning, evenings or study in the weekend – whichever suits your personal schedule. Study from the comfort of your own home – no need to venture out on a wintry morning or miss the first twenty minutes of a lecture because of traffic. Studying online means you don’t have to leave your job and uproot your life. It gives you the opportunity to up-skill in your chosen field and gain real world experience at the same time. You can benefit from a wide range of student discounts and offers across many brands. Online Business School students are now eligible to purchase an NUS Extra Card. Alton Towers – Use your student discount to enjoy up to 52% off tickets for Alton Towers Resorts. You can get your hands on student tickets for as little as £20 in September. EE Mobile – Students get 20% off and a 500MB data safety net every month. Forever 21 – Receive 20% off your next purchase. Valid until Sunday, 1st October 2017. Frankie & Benny’s – Get 20% off your total food bill at Frankie & Benny’s when you buy two main courses. Offer valid every day of the week. HP – 30% off at HP. 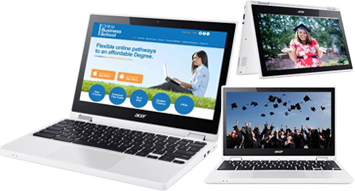 Take advantage of the generous saving and treat yourself to a new laptop, tablet or printer ahead of your studies. Missguided – Enjoy 20% Student Discount and free next day delivery when you shop with Missguided. Specsavers – Students can benefit from 25% off glasses. Spotify – Students can get 50% off a Premium account. Ted Baker – Students can receive 20% off full-price items until 8th October. WHSmith – Get an exclusive 20% off all stationery and cards at WHSmith until the end of September, with your NUS extra card. Make the most of the August Bank Holiday weekend with your pick of events and activities across the UK. There’s so much to enjoy, you’ll be spoilt for choice. Manchester Pride’s flagship event, The Big Weekend, is part of The Manchester Pride Festival and takes over the August bank holiday weekend. With performances from Clean Bandit, Louisa Johnson, Pixie Lott and many more, it’s shaping up to be another unforgettable festival event. The Bolton Food and Drink Festival brings a line up of star chefs, street food and live music to the town centre from August 25 to 28. There will be cookery demonstrations and masterclasses, as well as street food stalls and music stages with live performances from local musicians. An immersive festival experience in an abandoned woodland village with some of the biggest names in house music. It also has a Lake of Tranquillity which offers festival goers a chance to relax and pamper themselves. The Ice Cream Festival will be held at Kent Life on Monday, August 28. Sample tasters from ice cream vendors, or visit the chocolatiers and sweet stalls with treats from candy floss to popcorn and snow cones. Families will also be able to take part in fun activities on the farm, including farm rides, face painting and the chance to meet plenty animals. This 5-mile safari drive, the longest in the UK, is home to 750 animals. You can expect to see rhinos, zebra, wildebeest and forest buffalos, as well as camels, wolves and tigers. Explore the subtropical gardens, lose yourself in the maze and wander down to the Helford River to watch boats, skim stones and build sandcastles. Take a Blue Badge guided tour through the corridors of power, where the experts will explain all the complicated and historic rules that govern the House of Lords and House of Commons. The tour includes Westminster Hall, the Queen’s Robing Room and the Members Lobby among other places of note. Explore a diverse collection of museums and exhibitions, all within a short stroll of each other. Whether you’re into fashion, art, the Romans, or the Georgians, the museums of Bath offer a wealth of remarkable history. Spend a warm summer evening watching a film outside in a magical location with The Luna Cinema. Gastro vans are usually on hand to feed you everything from smoked ribs to pizza. The UK is a wonderful place to have fun and study! Explore our university pathway programmes, which will fast track you to an affordable UK degree. The Level 3 University Foundation Programme is designed for learners who wish to progress to a business or management degree but may not have the traditional entry qualifications usually required. You will develop a wide set of skills that can be used for further training and development. The National Qualifications Framework sets out the level at which a qualification can be recognised in England, Wales and Northern Ireland. A Level 3 qualification is the equivalent level to an A-Level, although it differs by having a framework which is specific to a particular industry. What makes our Level 3 Diploma so beneficial? Forget about attending classes for hours, sitting in an uncomfortable chair and listening to the same voice. Stay at home and learn, you don’t even need to get dressed for class. All learning materials are provided via online platforms, so you can choose to study whenever and wherever you want. Going to university is an expensive business, so you need to ensure you are prepared for it financially. The flexibility of our online diploma course enables you to study and work at the same time, so you can earn some money for your university nest egg fund and gain valuable work experience. 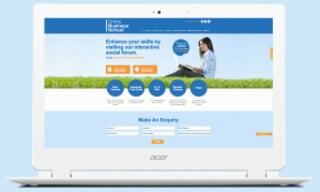 The online classroom utilises a range of new tech to make learning engaging and social. You’ll have the opportunity to take part in regular lively interactive forums, live streamed webinars and video chats with tutors. A full A-Level requires two years of study, while our online diploma can be completed successfully within a year. So, if you’d like to fast track your way to university within the next year, a diploma is the option for you. A-Levels are heavily exam-based, whereas our diploma is based around assignments and multiple-choice assessments. The focus on coursework is good preparation for university as the practice will enable you to develop your writing skills. Online learning requires more self-reliance and stronger organisational skills than traditional classroom-based learning. Online learners stand out from the crowd as they have the self-motivation and drive to succeed. Check out our University Foundation Programme. The course is pitched at Level 3, the equivalent level of study to an A Level. On successful completion of the course, students receive an ATHE Level 3 Business Management qualification which is fully regulated by Ofqual. Students can then apply for admission onto a full Undergraduate Degree programme from a range of UK universities. Alternatively, students can opt to study our Level 4/5 Extended Diploma in Management and then go on to complete an Undergraduate Top Up at a range of UK universities. It’s a nerve-wracking time and your emotions are running high. Try not to agonise – we’re here to help you prepare as best as you can as the day draws near. There is nothing you can do about your grades at this stage, so try to enjoy the remainder of your summer holidays. Try to take your mind off your results by doing things you enjoy – see friends, read a book, go for a walk etc. Although it’s natural to be nervous, don’t let yourself get too worked up about something you can’t change. If you’re feeling anxious, confide in your family so they can support you. It is sensible to prepare yourself for every eventuality. Think about different circumstances and how you’re likely to react. If you miss your grades, will you retake or will you apply via Clearing? If you do better than expected, will you apply for Adjustment? If you do well in a certain subject, will you change your course? If you feel your results aren’t accurate, will you challenge them? No matter how confident you feel, it pays off to have a back-up plan in place. Do some research on which universities you’d like to go to in case you require clearing. Write down three points about why you like each university, you can then refer back to these if you end up applying via clearing. Remember that university is only one pathway to higher education. If you don’t do as well as expected or you have changed your mind, don’t panic. There are different and more flexible ways to get a degree which may suit you better, from apprenticeships to distance learning programmes. If you’ve struggled with A-Levels and do not wish to resit, then you might want to consider applying for a Higher National Diploma (HND) course, which does not have an exam component and may allow you to skip 1-2 years of a University degree course. Whether your results were what you were hoping for or not, you still had to sit through months of revision and exams, which means you deserve a reward. It’s highly likely you’ll have reached a conclusion about your future by the end of the day – have a treat waiting for you to celebrate this significant event! You can be forgiven for thinking that all roads lead to university. However, university is not the right choice for everyone, there are plenty of other options to consider. So, to help out, here are five factors to consider whether university is the right choice for you – or not. If you do what you love, you’ll love what you do. The purpose of a university education is to give you the time and space to study something that interests you. Most of your time spent at university will be studying, so if you don’t enjoy it you will be miserable. If you don’t know what drives you or where your natural strengths lie, it may be worth taking a gap year to work it out – you don’t want to invest your money and time in something you’re not sure about. Why do you want to go to university? What are you hoping to do when you finish? Understanding your end goal can help you explore other options and work out if university is your best route. Some people choose university because they don’t know what else to do; make sure you are clear about your motivation for a university education. One of the main reasons for going to university is to put yourself in line for a better job and make yourself more employable, so career prospects should be a top consideration. Be sure to research the field you want to study; you don’t want to go through years of studying to find no jobs at the end. The average graduate is shouldering £50,000 worth of debt, while the average graduate salary is currently £28,000. Take some time to research the average salary for the profession you hope to go into post-university. If your dream job pays lower than the national average, and the tuition fees leave you in lots of debt, you will need to assess if going to university is worth it. There are many different costs associated to university. In addition to tuition fees, you have to cover accommodation, living expenses, travel, course books and a laptop. It can get expensive quickly so you need to decide how valuable the experience will be to you. Can you do things differently? All you need to decide is whether university is the right choice, right now. If you aren’t sure, then take some time to figure out what you really want. Don’t follow the crowd and go to university because that’s what everyone else does. Nowadays there are plenty of other choices for those who want to further their career. Make sure you research all your options before you apply as this will help you to decide if university is a worthwhile investment. A part-time degree – you can combine studying with other commitments. Degree apprenticeships – you can enjoy practical on-the-job training alongside studying. Distance learning courses – you can study at a time and pace to suit yourself. Earning a full Degree or MBA is a simple and low cost option with Online Business School. We provide students with the opportunity to earn their diploma online and then top up to a full Bachelors or MBA degree through distance learning or on-campus through at a UK university. You can read more about our university pathways here. The way we here at Online Business School see it, hardworking students deserve to get something back for their dedication to those long study sessions. So, we have put together a list of our top 10 student discounts for you to enjoy in August. Remember to sign up for a Student Beans account – it’s free with your NUS card and gives you access to exclusive student discounts at over 10,000 stores online. Burton Menswear – Get 10% off clothing all year round. Domino’s Pizza – Receive a massive 35% online student discount at Domino’s Pizza when you spend £25. Dorothy Perkins – All students get an exclusive 10% off. Hotels.com – 10% student discount at Hotels.com with Student Beans. KFC – Get 15% off when you spend £5 or more at participating stores. Las Iguanas – Enjoy 25% off your food bill. Offer valid Sunday – Thursday for up to 6 people. Ted Baker – 15% student discount on full price items. The Body Shop – Enjoy 25% off your purchases. The Co-op – Get 10% off your food shop. Become a member, and you’ll earn another 5% – as well as giving 1% back to local causes. Uber – £15 off your first journey with Uber. To find out more about registering for an NUS card with Online Business School, click here. Don’t forget that the NUS card comes with a free ISIC card, so our international students can still benefit from thousands of discounts. We are pleased to announce that we are now an NUS (National Union of Students) affiliated organisation. We are always looking for ways to help our students and are therefore delighted that our students are now eligible to purchase an NUS Extra Card. The NUS extra card also comes with a free ISIC (International Student Identity Card). The ISIC card is the only internationally accepted proof of certified student status. It provides over 42,000 international discounts in over 130 countries. You can view all the discounts and offers available here. Please visit the NUS website to order your card. Distance learning courses have become increasingly popular with both companies and individuals. The Higher Education Academy reported that employers favoured distance learning as a way of delivering career-related study. Investing in staff training encourages distance learning courses is not only beneficial for employee development, it also delivers real, lasting benefits to a business. It can however cost a lot of money and time – luxuries many businesses cannot afford. Let’s explore the benefits of distance learning and how this can offer a valuable solution to both employers and employees. Time is an asset many businesses don’t have enough of and taking staff away from the office can be a struggle. Employers are hesitant, or sometimes reluctant, to allow their employees a few hours out of the office to attend training sessions. The distance learning model circumvents the need to attend classes at a set time every week; employees can fit learning around existing professional responsibilities and gain a new qualification. One barrier for employee training is often the financial cost; small business budgets mean that staff training is often the first thing to be cut. A very important advantage to distance learning is its cost-effectiveness; distance learning courses provide the same level of higher level learning opportunities as with larger companies, but at a fraction of the cost and with no travel costs or time. Your employees are arguably your organisation’s most valuable asset. Training can improve business performance and profit by ensuring your staff are up-to-date with the latest trends and developments in the business landscape. Distance learning programmes offer your employees the chance to develop their skills and knowledge, which gives them the tools to do their jobs to the best of their ability and therefore increases their contribution to the business. Want your staff to stay? Make training a priority. Investing in staff training not only encourages employee engagement and motivation but it also creates a sense of loyalty to the organisation. Showing that you are willing to invest in your employees makes them feel valued – happy, focused workers tend to stay with their employers. Online Business School has developed in-company training courses which are mapped against OFQUAL RQF credits and provide access to top up university programmes. Companies can purchase access to the materials for their staff and the materials can be used as standalone CPD resources and can of course be supported by live training or mentoring. Read more here.